MOSCOW, August 8. /TASS/. A group of warships and support vessels of the Russian Northern Fleet has set off on a voyage to the eastern Arctic, the Fleet’s press office reported on Wednesday. "Today, a group of warships and support vessels of the Northern Fleet has left the Fleet’s main base of Severomorsk for the Barents Sea, heading for the eastern Arctic," the press office said. "The naval group includes the large anti-submarine warfare ship Vice-Admiral Kulakov, the large amphibious assault ships Alexander Otrakovsky and Kondopoga, the ocean minesweeper Vladimir Gumanenko, the icebreaker Ilya Muromets, the tanker Sergei Osipov, the rescue tug Pamir and the crane ship KIL-143," the press office said. The voyage aims to ensure safe shipping and provide for Russia’s other maritime economic activity in the Arctic region. During the voyage, the sailors will practice search and rescue measures and the provision of assistance to notional vessels in distress in high latitudes. 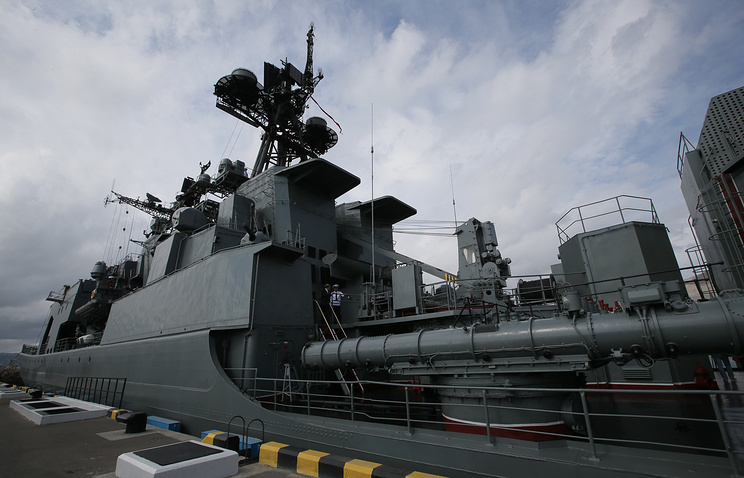 For this purpose, two Ka-27 helicopters and a flight operations group have been placed aboard the flagship Vice-Admiral Kulakov. The naval group will sail along the Northern Sea Route, most of which is currently free of ice. The Northern Fleet has been carrying out regular voyages to the Arctic since 2012. This year, the Northern Fleet warships will embark on their seventh Arctic voyage.